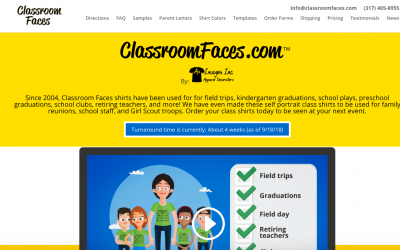 Since 2004, Classroom Faces shirts have been used for for field trips, kindergarten graduations, school plays, preschool graduations, school clubs, retiring teachers, and more! We have even made these self portrait class shirts to be used for family reunions, school staff, and Girl Scout troops. Order your Class Shirts today to be seen at your next event. For orders postmarked between 10/11/18 and 10/31/18, receive a FREE TEACHER SHIRT if you select BLACK ink for your order when you purchase 15 or more shirts. Sorry, but this offer is not valid on previously placed orders and no price adjustments on previously placed orders will be given. All other standard policies apply. Use promo code FACES-NWS18 on your order form. The World’s Most Amazing Class Shirts! Please read through our directions and FAQ pages to find out how to properly make great-looking Class Shirts. These pages thoroughly explain the process and answer any questions you many have. Optional: Take a look at our samples page for design ideas, and/or download one of our parent letters to assist with the ordering process. Just don’t forget to change the info on the letter to apply to your class! Choose the template that works best for your class or group. We have different sizes in our regular templates, the largest for younger children and the smallest for children with better fine motor skills. If your class wants something a bit more fun, we also offer several different templates: balloons, puzzle pieces, stars, and more! Download an order form. Fill out what you want the shirt to say and choose colors you’ll want for your Class Shirts and ink. You can use your school’s colors or any of dozens of combinations! Visit the shirt colors page to see our recommended shirt and ink color combinations. Next, list the quantities of shirts you would like to order. Finish up by adding your billing, shipping, and contact info. Mail us your drawings and order forms. We will process your order the same or next business day we receive it. If there is an issue, we will contact you. If not, you will not hear from us until we send your proof. Once we receive your signed proof, we will print and ship your order according to the date listed on your proof. Please promptly respond if we contact you about issues and when we send your proof. Delayed responses may cause significant delays in turnaround time.